Ready for action in competitive games and delivering a professional performance time and again, play with the Catalyst XV Match Rugby Ball in Red, White and Black from Canterbury. 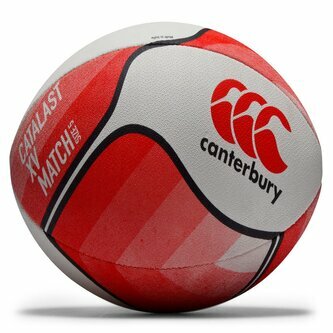 This quality match rugby ball from Canterbury has been hand stitched and designed to IRB standards with a 3 ply super polycotton laminate construction that has Super-Match rubber compound surface with Haptic grip technology adapted for all weathers. Ideal for those that play at a casual to semi-professional level, step up your games and training with the reliable Canterbury Catalyst XV Match Rugby Ball.